The five proposals for The Ebbsfleet Landmark sculpture (nicknamed "the Angel of the South") have been cut down to three. The remaining proposals are Mark Wallinger's giant horse, Richard Deacon's construction of triangles, and Daniel Burren's tower. The whole commision seems absurd to me the commisioners seem to think they can recreate the success of Antony Gormley's Angel of the North by commisioning an even bigger artwork. They are forcing artists to work on a scale that is completly inappropriate and which, I believe, will result in a terrible piece of sculpture. I think the project will be a failure, the best that can be hoped for is damage limitation. A dry, conceptualist like Daniel Burren was unlikely from the beginning to produce a work that the public would respond to in the way they have The Angel of the North. I am sure his piece will not be built - it's strange that he was even asked to make a proposal. Richard Deacon is one of the top contemporary sculptors in the world today and he is the only artist on this shortlist who can truthfully be referred to as a sculptor. His proposal for the "Landmark" is far from his best work, though I think it is the best of the five original proposals. I don't think the public would warm to the work and it would probably be ridiculed by as just a pile of sticks. 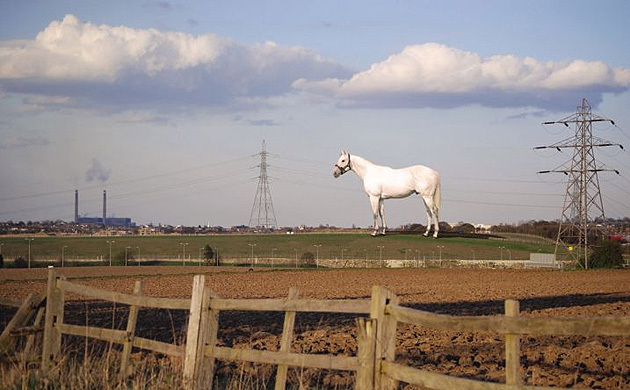 Wallinger has proposed a sculpture of a giant horse. The computer generated visualisation of the piece in situ looks like a photograph of a real horse photoshopped onto the site. The work will be actually be coloured to look exactly like a real horse! This proposal is the only one that I think has the potential to become a landmark and to be well recieved by the general public. I think Wallinger is going to win but I also think this horse will be one of the worst piece's of sculpture ever produced. I think this is the laziest proposal of the whole lot and the lack of effort it displays is charactertistic of Mark Wallinger's work since winning the Turner Prize. He has too many opportunities to create ambitious works and has the resources made available to carry them out too easily. The demand for the artist and the ease with which he now can realise these ambitious projects seems to have resulted in a lack of real work, a lack of the struggle that is at the core of any artist's creative process, and a lack of vitality in recent works such as his contribution to the Folkestone triennial. The horse is a five second idea. If you took to the streets and asked people at random what kind of sculpture they would like to see I'll bet a horse would be one of the top five responses. It seems to me to be an idea that the artist has just thought up rather than arrived at through a creative, sculptural process. Wallinger does not have enough experience of large scale sculpture to successfully undertaking a commission of such extraordinary scale. Few, if any, artists actually do. The potential for failure is a large part of any artists process. Any artist produces a certain amount of crap work which never sees the light of day. Once work begins on this sculpture there is no going back. The desctruction of the work is not an option. When producing work on a momentous scale there is the potential for momentous failure. Wallinger is out of his depth. He is an artist who dabbles in a range of media one of whic is sculpture. There is no room for dabblers when commisioning a sculpture of this scale and expense. I'm convinced they will commission Wallinger's piece and in do doing so they will get their "Landmark" and they will get their stories in the press. What they won't get is an excellent piece of public art and this is ultimately the fault of the commissioners. They created a ridiculous brief in an attempt to imitate the success (in terms of popularity and iconic status) of the Angel of the North the extent of which could not have been planned or predicted by either the artist or the commisioners.